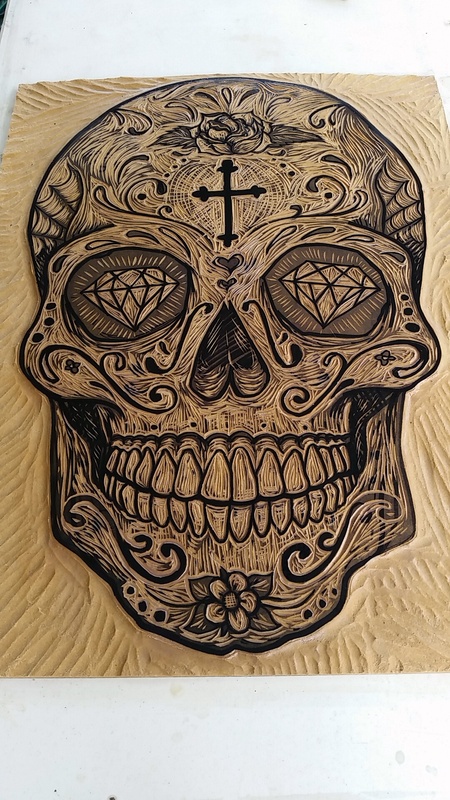 Artistic Style: I primarily work in woodcut and linocut relief, which is a technique in printmaking where the image is carved into the surface of wood or linoleum using handheld gouges. Parts of the surface that are left will be printed, whereas the parts carved away will not. The surface is then inked with a paint-like roller called a brayer, then printed onto paper using an etching press. Printing can also be done by hand-burnishing the paper on the block using a baren or wooden spoon. As far as actual style goes, it’s hard to say. I continue to practice my carving techniques so my style is constantly changing. How long have you lived in Oxford? I moved here in 2007, so almost nine years. Early art experience: As a child I knew I wanted to be an artist. I still have drawings [from] when I was in kindergarten! I grew up watching cartoons like Looney Tunes, Sonic the Hedgehog, Biker Mice from Mars, Ninja Turtles, and Dragon Ball Z. I would print out images of cartoon characters and practice drawing them. I always had classmates ask me to draw them something and to sign it, because one day I would become famous. My passion for drawing came to a standstill when I transferred to private school in the seventh grade. I basically had to search for my creativity when I switched my major to Art my sophomore year in college. 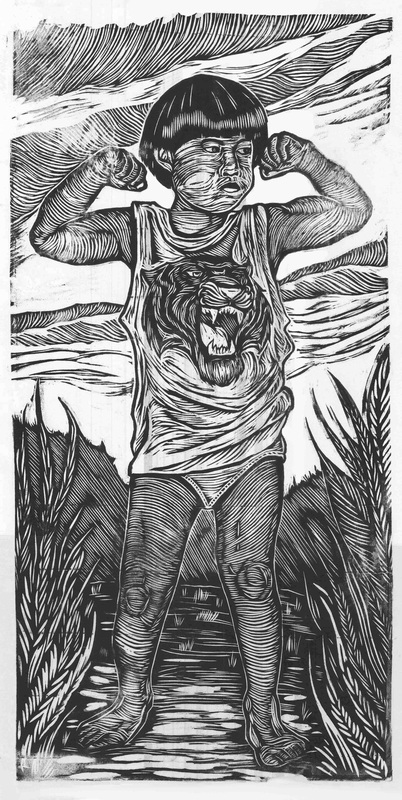 Favorite visual artists: When I got into printmaking, I was inspired by José Guadalupe Posada, Leopoldo Méndez, and Elizabeth Catlett. Now artists like Joseph Velasquez, Tom Huck, Dennis McNett, Dylan Goldberger, and Mazatl, just to name a few motivate me. Being a part of the printmaking community also helps with ideas and suggestions. Art school? I received both a Bachelor of Fine Arts with an emphasis in Printmaking and a Bachelor of Arts in Sociology at the University of Mississippi. Favorite book or author: I can’t really say I have a favorite book or author. I have a multitude of printmaking books that are my go-to books when I need help or inspiration. Do you work out of a studio? Currently, my garage is the studio. I eventually want get the floor sealed, cabinets, fluorescent lights, and an A/C unit in there, the whole nine. How many hours to you spend in your studio each day? I try to spend at least one hour doing something, whether it’s sketching or carving. Sitting behind a computer every day for eight hours really drains my motivation though. Most productive hours? I get a lot of my studio time in after work, so any time after 5 pm and usually all day Saturdays and Sundays. But if I’m in the zone, I can stay in the studio all night, even during weekdays. I just have to make sure I don’t bring any ink into the bed. Favorite project you’ve completed: I have two. The first is my BFA Thesis work titled My Red, White, and Blue. I carved out four giant woodblocks (three 30” x 42” and one 92” x 42”). It dealt with immigration from Mexico to the United States. It was the first time working in large scale, so I figured go big or go home. I’m currently in the process of recarving those images into a smaller scale. The second was the steamroller event during last year’s Fringe Festival. It was Oxford’s first ever steamroll event, and I’d like to think it was an overall success. I couldn’t have done it without the help of friends and family. It would be great if it could be a yearly event to share with the community. Three ideas you want to explore in art: Reduction printing, screen-printing, and texture. Most of my prints are in black and white. Usually any color added is with watercolors. Learning to perfect reduction printing would give my prints a different style. Reduction printing, also known as suicide printing, is a multi-color print that is created by using only one block and by cutting away each color bring printed. After printing one color, there’s no going back, because that area has been carved away. Each color is printed on top of the previous color until you’re eventually left with the outline on the woodblock or linoleum block. I never could get screen-printing down, so I would like to go back and explore that technique. I’m also constantly exploring ways to improve the texture I want in my imagery. Where can we see some of your art on display? I have a few pieces up at Volta. In the past couple years I’ve done a few art shows and festivals but I decided to take this year off to focus on my own personal artwork. I do however still take commissions. You can always keep up with what I’m working on through social media. My website is FrankEstradaArt.com. Do you have a “day job”? If so, where? I work for RJ Young, the largest independent office equipment dealer in the Southeast, which specializes in document management solutions, print services, 3D printing, you name it, they can do it. My job is to digitize ALL the sports memorabilia in Ole Miss Athletics. Anything and everything related to Ole Miss Sports. It can be a poster, program, newspaper, magazine, or game card. I enjoy it. It’s amazing to see old cartoons, illustrations, photos, and articles. It’s crazy how so much has changed over the years in both society and sports. Favorite music/bands: My wife has been playing Mashrou’ Leila recently so I’ve been listening to that. I have no idea what they’re saying since it’s in Arabic but I enjoy it. You can catch me any other day listening to believe it or not Adele’s 25 album, Big K.R.I.T., David Banner, Le$, Outkast, Project Pat, Slim Thug, Three 6 Mafia, and UGK. Where do you hang out in Oxford? I’m pretty much a homebody. If I do go out, it’s with friends usually at the Blind Pig or Volta. Aspirations: I applied for an Artist Fellowship through the Mississippi Arts Commission. If I get the grant, the plan is to purchase a smaller etching press that way it can easily be transported. I have one already but it weighs at least 400 lbs. I can’t carry that on my own. I’d love to do more demonstrations in Oxford and the surrounding areas, whether it’s on campus, a local school, or the Powerhouse. I may not be the best at what I do, but I love what I do.